Horse riding and travel often go hand in hand. Californian Tracy Hofstrand is attempting to ride on all of the continents (Antarctica excluded, though she plans a visit there). Being an endurance rider, and being that Australia is another continent to conquer, and that the country just happens to hold a challenging endurance ride in the Tom Quilty, it was an obvious choice for Tracy to ride in it. "It is a difficult ride, a national championship. Also the ride has the most entries that I will ride in! It is bigger than Tevis which I did in 2012," Tracy says. "It offers a nice buckle for completion awards, has a big party afterwards, and the people are very generous and friendly." Tracy's been riding endurance for 13 seasons, and has close to 3000 AERC miles. She will be riding Deanna and Roy Trevena’s 11-year-old Anglo-Arabian gelding Dumaresq Jackson. "Jack" has competed in endurance for 6 seasons; he completed the 2009 Shahzada 120-km Mini Marathon, and the 2014 400-km Shahzada. Tracy's husband Jeff will be her strapper for the ride. She's looking forward to seeing the Sydney, Australia area, visiting friends and hosts Lee-anne and Charlie Guaci whom she met on the 2011 XP ride, riding the trail, and making new friends. Most of all, with a bit of luck, "I'm most looking forward to coming home with a buckle to keep my Tevis buckle company!" I’m now in my final week of work before I drive down to Moab to reconnect with Christoph Schork for six weeks of Mongol Derby boot camp. Last weekend, I had my last run on a racehorse and as I rounded the final lap of a three mile gallop, it hit me how much stronger and braver a rider I’ve become over the last eight months. Eight months ago I couldn’t gallop half a mile without coughing and sputtering and feeling my legs build with lactic acid. Eight months ago I’d nearly crap my pants if a horse started spooking and bucking underneath me. I guess that’s the reality of returning to riding in your mid-30s after a seven-year hiatus. Underlining its commitment to maintaining the highest standards in the sport, the Emirates Equestrian Federation (EEF) has established an Endurance Committee to oversee a review into national and international endurance rides in the United Arab Emirates. The Endurance Committee, which will be under the direct observation of the UAE's National Olympic Committee, will seek to work closely with the Fédération Equestre Internationale (FEI) to ensure that the world governing body's rules and regulations are applied in all endurance races in the UAE. The review follows the FEI’s decision in March to suspend the EEF following an investigation into endurance racing in the UAE. Taleb Al Muhairi, Secretary General of the Emirates Equestrian Federation, said: "As the governing body of equestrian sports in the UAE, it is our goal to pursue excellence while promoting the growth of the sport and safeguarding the welfare of equine and human athletes. We recognise the best way to achieve this is to work closely with the FEI, the international governing authority, and as such have decided to withdraw our appeal against the suspension. You've got to watch out for those Aussies. They show up everywhere. It's particularly handy when they show up to participate in iconic American endurance adventures like the 2011 XP Pony Express. That's what Aussies Lee-anne and Charlie Guaci did, much to the delight of American endurance riders Brenda Benkly and Kathy Neunzig. In the spirit of equine friendship forged by shared trails, which is so special and contagious (and somewhat unique) in our endurance sport, after spending weeks on the XP together, the Guacis offered Brenda and Kathy mounts in Australia if they wanted to ride in the Tom Quilty. It will be Californian Brenda's first time in Australia. She's familiar with challenging endurance rides, with over 10,000 miles to her credit, and 19 100-mile finishes, including 7 Tevis buckles. She'll be riding the Gauci's 15-year-old part Arabian mare Charleville Lady on her first 100-mile ride. The Quilty has been on Kathy's Bucket List for some time, and the 50th anniversary of the Quilty was an added incentive for Kathy to take the Guacis up on their offer this year. A 7800-mile endurance rider with 12 100-mile completions, she'll be riding the Gauci's Charleville Jack, a 13-year-old part Arabian on his first 100-mile ride. "I am most looking forward to the whole event," Kathy says. "Reconnecting with friends, riding in one of the largest (if not THE largest) endurance events in the world-yikes!, seeing another country like few have the opportunity to, on horseback through the Australian bush, and getting my mount through his first 160K race. The world’s toughest and longest race is back for its seventh year, with 41 riders from 14 countries riding 1000km across Mongolia on semi-wild horses. As well attracting equestrian professionals, this year’s Mongol Derby features a range of competitors from paramedics to personal assistants. This year’s race has seven Brits and one Irish rider, in the guise of amateur jockey Paddy Woods (51) from Julianstown, who rode in the derby in 2013, but failed to finish the ride. The oldest Brit taking part is Iain Hayter (62) from Lymington. He broke his neck riding and was told he should have died, but says he wants to do the Derby “because it’s there”. I don’t share my compatriots’ obsession with soccer, but have been wedded all day to the BBC’s 24-hour news channel to follow the gripping developments in the FBI arrests of FIFA officials, dragged from their beds in a luxury Zurich hotel at dawn on charges of corruption. The US attorney general gave a press conference in New York and explained why decent folk won’t tolerate FIFA’s criminal tendencies any more. Is it too much to hope we are on the cusp of a new global movement to throw the book at all the talentless suits whose involvement in sports is purely self-serving or nefarious? If so, credit to the FEI for taking tough action against the bad apples in equestrianism before being publicly shamed into doing something by a much higher authority – or worse still, having matters taken out of its hands, as is now happening to FIFA. Or at least I think so: it’s kinda interesting that the head of the UAE national Olympic committee visited FEI headquarters Lausanne yesterday, the same day as UAE equestrian representatives met the FEI to discuss the long road back from their suspension over the endurance crisis. The UAE Olympic body will be supporting a new committee set up to “strengthen” UAE endurance. Maybe the IOC has given relevant stakeholders a quiet nudge, but there is no doubt the FEI swiftly developed unexpected steeliness upon the departure of Princess Haya (whose brother, Prince Ali, oddly enough, is the sole candidate taking on Sepp Blatter in the FIFA presidential election on Friday, should it still go ahead, of course). 50th Tom Quilty and Paul Sidio: "Can you imagine anything more exciting?" It's those fun-loving, horse addicted Aussies that have Paul Sidio returning Down Under to ride in the Tom Quilty again. He rode in the 2013 Quilty but did not complete, but the people he met there made the trip incredibly enjoyable. "There was no doubt that we would head back to try again in 2015. The fact that it is the 50th edition only makes it even better," Paul says. From Spokane, Missouri, Paul has been riding endurance in the USA for 13 seasons, with close to 4000 miles, and 13 100-mile completions. Paul finished Tevis twice on his gelding Piper (KMA Chazz Piper), and he loaned Piper to his Aussie friend Greysen Clark in 2014 for the Tevis. The pair made it 60 miles before being pulled. Greyson is returning the favor, supplying Paul's mount for this year's Quilty, 11-year-old Arabian Grey-Gun Vanharlen. Vanharlen has completed the Faraway Easter Carnival, a 320-km marathon, though the Quilty will be his first 100-mile ride. Paul will be traveling with his wife, who will be his "strapper" for the ride (crew in Aussie talk). "In Australia, for the Quilty and other big rides, they arrive early, have fun, and leave late," Paul says. "It is not just a one or two day thing; it is a week long funfest. I most look forward to the late night bonfires, and the tall tales being told . . . some of which are even partly true!" With close to 400 horses scheduled to start the 100-mile ride at midnight, it will be an unforgettable experience. "They will have a big sports event large screen TV showing the leader board and on track videos. They will have loudspeakers playing music including the famous Tom Quilty Ballad. There will be stadium lights shining on the riders and horses as they circle and warm up for the start . . . at midnight . . .
"Can you imagine anything more exciting?" An initial meeting between the FEI and representatives of the United Arab Emirates National Olympic Committee and National Federation was held at FEI Headquarters in Lausanne (SUI) this afternoon to discuss the actions that need to be undertaken by the UAE National Federation before the FEI Bureau can consider lifting the suspension currently imposed on the UAE National Federation. The FEI Bureau provisionally suspended the UAE National Federation in March of this year following an investigation by the FEI into major horse welfare issues and non-compliance with FEI Rules and Regulations in the discipline of Endurance. Today’s meeting was chaired by FEI Secretary General Sabrina Zeender. The FEI was also represented by Brian Sheahan, Chair of the FEI Endurance Committee, Manuel Bandeira de Mello, FEI Endurance Director, and Mikael Rentsch, FEI Legal Director. The UAE delegation was made up of Taleb Daher Al Muhairi, Secretary General of the Emirates Equestrian Federation, Faisal Al Ali, Assistant Secretary General, and Abdullaziz Sheikh, Head of the Endurance Department. The FEI made it clear to the UAE delegation that only the FEI Bureau can lift the suspension and confirmed that the suspension will remain in force until the Bureau has agreed that all necessary processes have been put in place by the UAE National Federation to ensure horse welfare at all times and that FEI Rules and Regulations will be fully implemented and enforced. Prior to the meeting, FEI President Ingmar De Vos had welcomed to FEI Headquarters Mohammad Al Kamali, Secretary General of the UAE National Olympic Committee, who had accompanied the UAE National Federation representatives to Lausanne. Neither Mr De Vos nor Mr Al Kamali attended today’s meeting. Taleb Al Muhairi, secretary general of the Emirates Equestrian Federation (EEF), is to meet International Equestrian Federation (FEI) officials in Lausanne on Tuesday (May 26), amid signs that efforts to persuade the FEI that it can justifiably lift a suspension imposed in March are getting under way. The EEF has now launched a new committee to oversee a review into endurance racing - the discipline that aroused the FEI’s concerns - in the United Arab Emirates. The Endurance Committee, which is to be under direct observation of the UAE’s National Olympic Committee, will seek to work closely with the FEI to “ensure that the world governing body’s rules and regulations are applied in all endurance races in the UAE”. The UAE was suspended from the FEI in March following an investigation into “major horse welfare issues” and allegedly faked results in endurance events. The governing body’s Bureau, chaired by FEI President Ingmar De Vos, ruled that the EEF “may not attend or be represented at any session or meeting of any body of the FEI, may not organise any international events, and its members cannot participate in any international events”, although UAE athletes from disciplines other than endurance would be permitted to compete under the FEI flag in international competitions organised outside the country. A Horse & Hound team has completed the Golden Horseshoe and came third behind stiff competition. Showing, vet and point-to-point editor Aimi Clark, designer Emily Secrett, news writer/digital sub editor Rachael Hook and dressage/print sub editor Polly Bryan took on the 23km pleasure ride at the 50th anniversary event last weekend (17-19 May). Their team section was won by the Golden Oldies, experienced endurance riders Liz Finney, Sally Hall, Marie Maclean-Foreman and Jane James, who finished with a score of 127.58. “We all absolutely loved the experience, the ride was beautiful and everyone was so welcoming,” said H&H team member Rachael Hook. 50th Tom Quilty and Jenna Towner: "I'm the luckiest person alive"
It's been called "the world's biggest horse endurance ride," and that may well be true, with 380 horses and riders on the start list for Australia's 50th anniversary of the Tom Quilty Gold Cup on June 6-7 in Hawkesbury, New South Wales. It's the Australian equivalent of America's Tevis Cup: 100 miles in one day, the premiere ride that almost all endurance riders aspire to at some point in their endurance lives. The idea of the Quilty was started by Queenslander RM Williams in 1966, then editor of Hoof and Horns magazine, after hearing and printing stories about the Tevis Cup in California. RM asked his friend Tom Quilty, "a great horseman and cattleman" for help; Quilty donated $1000, which was used to make a gold cup, which became the perpetual trophy for the ride. Of the nine riders from the USA scheduled to start in this year's Tom Quilty, it just might be Californian Jenna Towner who is the most excited. She signed up for the Quilty before she was even qualified to ride it. "I'm 42 and just started riding Endurance two years ago," Jenna says. "I rode Hunter/Jumpers my whole life, but after incurring several injuries in Baghdad, I just couldn't afford to get thrown off a horse. Still, I longed for the woods - and since I could no longer go hiking with my dog (my favorite thing ever), this sport called to me with enormous vigor. I feel sincerely grateful every day that I found this sport . . . even if it took me 40 years." With her own horse PR Toronto rehabbing from an injury, Jenna's good friend Kristen Vaught loaned her horse Sammies Ace to Jenna for the Twenty Mule Team 100 in February, for Jenna's first 100-mile ride. With the pair finishing the 100-mile ride, Jenna was qualified to start in the Quilty. Jenna will ride the 11-year-old Anglo Arabian mare Monkhani Lodge Noble's Locket, owned by Emma Holland of Roswick Endurance in Victoria. Roswick Endurance and Performance horses breed, train, and compete Arabians in endurance, racing, dressage, show, and pleasure. The mare recently completed the Derghorn 160-km ride in November of 2014. Traveling to Australia for this momentous event, Jenna is combining her travel bug with her love of endurance. She is most looking forward to the starting line. "At midnight, mounted upon a strange horse in a strange land, staring down a crowd of over 400 excited horses . . . that moment before it all begins is when my mind is most quiet and I realize 'Damn, I'm the luckiest person alive'. "For me, it's always about the starting line. Finishing is a grand and amazing bonus - but sometimes we lose sight of the struggle it took to just show up." The Dutch equestrian federation has sacked its successful endurance coach Emile Docquier in the midst of allegations of fraud over a permit issued to UAE-based Pakistani endurance trainer Anzaq Mehmood. 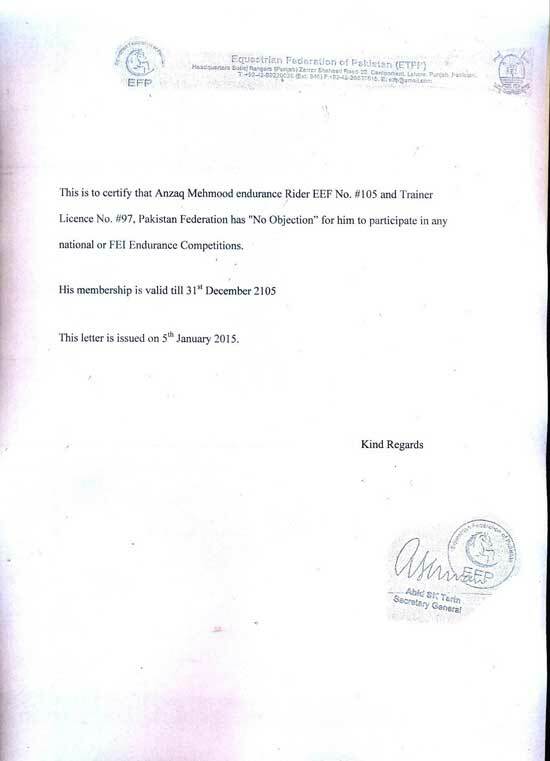 The federation says it has parted company with Docquier due to “difference of opinion.” However, their decision came just days after it emerged that the permit, allegedly issued by the Pakistan federation, accompanied entries for a national ride at Schilde, Belgium sent in by Docquier’s office. Riders from as far afield as Hong Kong tackled moorland terrain, steep hills and rivers to as part of one of the Golden Horseshoe endurance ride. Following months of training, horse riders have put their stamina to the ultimate test by taking part in the infamous Golden Horseshoe endurance ride. Over 200 competitors spent the weekend navigating Exmoor’s rich landscape of rolling hills valleys and water crossings, with routes varying in length from 15 to 100 miles. London, May 15 (BNA): Following the leadership of His Majesty the King’s Representative for Charity and Youth Affairs, Supreme Council for Youth and Sports Chairman, Bahrain Olympic Committee President and Bahrain Royal Endurance Team Captain HH Shaikh Nasser bin Hamad Al Khalifa, Bahrain Royal Endurance Team won the first three places in the endurance race of the 73rd Royal Windsor Horse Show, held in the United Kingdom today. HH Shaikh Nasser bin Hamad Al Khalifa won first place for the second year in a row. Team members Shaikh Mohammed bin Mubarak Al Khalifa and Raed Mahmood won the second and third places respectively. A breeder of Arabian horses is celebrating 50 years in the business this weekend, opening his stud's gates so the public can see some of the famous bloodlines. With the 25km Golden Horseshoe ride looming, and having not sat on a horse since going hunting on New Year’s Day, I got in some match practice by heading to Somerset to ride my potential mount for the event. Sunny, a buzzy 16.3hh ex-pointer, isn’t the usual type of horse you would imagine taking part in an endurance event, but I’m sure he will prove an excellent partner. He has been very kindly lent to me by Jess Baker. Fellow H&H team member Emily Secrett and I were lucky enough to have beautiful weather as we set off onto Exmoor. For the first half of the ride, my attention was more focused on the car rally that was taking place in the area — all four of us were acutely aware of the ominous sound of rally cars in the distance. Thankfully, after being chased up a hill by one such rally car, and Sunny displaying some minor acrobatics, we were into the peace and quiet of the moor. The sun is shining and the temperature climbs to around 40 degrees Celsius across the United Arab Emirates at this time of the year. It is safe to assume that the air conditioning in the Abu Dhabi headquarters of the Emirates Equestrian Federation is set to a much more comfortable level. It’s been interesting to read reaction on social media to the FEI’s suspension of the UAE, posted by disparate (and maybe desperate) parties around the world who make their living selling endurance horses to Dubai and Abu Dhabi. It is strongly rumoured that if the suspension drags on, the UAE will simply set up an independent regulatory body to organise its favoured style of racing-speed, high attrition endurance. By all accounts, their public disgrace has not hindered the UAE’s current buying spree in Europe. My first, admittedly facetious, reaction was: why bother with the farrago of creating a new governing body? Just as easy to pick a piste and charge off, mob-handed, cobbling up a results sheet later just in case anyone wanted one, as is already a well-honed practice in those parts? The future of FEI Endurance racing was discussed at April's FEI Sports Forum in Lausanne, Switzerland. Statistics were presented at the endurance session, showing correlations between injuries for event levels and speed of horses at WEG and World Championship events. As one might expect, the higher the level of competition (i.e., CEI1* vs CEI2* vs CEI3*), the higher the injury rate, in numbers and percentages; and as the speed of WEC and WEG horses increased over the years from 1986 to 2014, horse completion rates decreased at roughly the same rate. An alternate format for the next World Equestrian Games Endurance event was proposed: from a 160 km 1-day format to a 2-day, 100km per day race with a Grand Prix finish (first across the finish line wins, and other finishers must finish within 20% of the winning time), and a next-day mounted Best Condition competition. Thought is that the format change will provide more strategic and technical competition, rather than all-out racing for 160-km, and that the overnight rest period will benefit horses. Another motivating factor for change is to make the endurance event more spectator friendly, make it easier on organizers to map a shorter course closer to the WEG venue, and increase revenue for the Organizing Committee. Equine Guelph director Gayle Ecker is among four finalists for the prestigious Equine Industry Vision Award for 2015. A record 25 nominees were made for the award, which recognises innovation, leadership and service in North America. The winner of the Equine Industry Vision Award, sponsored by Zoetis, will be announced on June 19. The trophy, created by master artisan Peter Wayne Yenawine, will be presented at the American Horse Publication Tally-Ho at the Alamo Seminar in San Antonio, Texas. THE quaint town of Killabakh saw the return of the Homewood Endurance Ride held over the Easter long weekend. Since the ride's debut on the Anzac weekend in 2014, word had spread of the incredibly scenic property and parks and hospitality of the Kiwarrak Club and Colefax and Homewood families, attracting riders from as far as Sydney, Coffs Harbour and Sunshine Coast to name a few, with some campers arriving as early as Wednesday. A Horse & Hound team will be taking part in the Golden Horseshoe this year — in which is likely to be the final time the ride takes place. 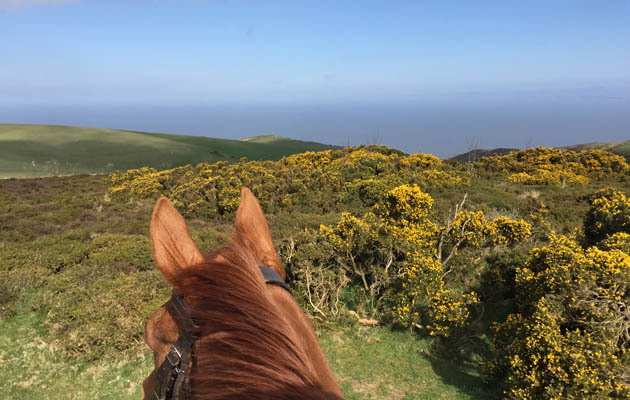 The 2015 Golden Horseshoe (17-19 May) will be the 50th incarnation of the ride, but is likely to be the last on Exmoor as no one has stepped in to take over from the retiring organiser. Ride organiser Barbara Wigley, 67, has been involved in the ride for more than 30 years and running it since 2007, but is stopping this year. The rest of her six-strong committee have said they are also giving up. Showing, vet and point-to-point editor Aimi Clark, designer Emily Secrett, digital sub editor Rachael Hook and print sub editor Polly Bryan will be taking on the 23km pleasure ride challenge on Sunday 19 May. Aimi will be riding her sister’s eventer, while the other three will be competing on borrowed horses. Maria Alvarez Ponton, double World Endurance Champion (Malaysia 2008, Kentucky 2010), and double European Champion (Assisi 2009, Florac 2011) (all aboard Nobby), won the 2015 Spanish Endurance Championship in Bascara, Spain on Saturday, aboard Tarathata. Final time was 8:04.15. Alex Luque finish second aboard Arai Polvorillo, coming in 16 seconds behind the winner. Cristina Yebra finished third, riding Girola de Quercus. Ponton and Tarathata averaged 19.33 km/h over the course. 11 riders out of 32 starters completed the course. On May 1 2015, in Rambouillet, France, Julien Goachet won the 160 km Rambouillet ride aboard Poly de Coat Frity, by just 4 seconds over second lace Gregoire Tilquin, riding Nafa de Bozouls. Riding time for the winner was 8:24.59. Jean Philippe Frances finished third riding Tarzibus in 8:28.19. 15 riders completed the race out of 32 starters. THE world's biggest horse endurance ride has already attracted more than 450 nominations from around the world as riders prepare to mount up at midnight on June 5 to compete in the 50th Tom Quilty Gold Cup. The 160-kilometre event is held annually over different courses around Australia, but returns to its origins in the Hawkesbury Valley north west of Sydney this year.